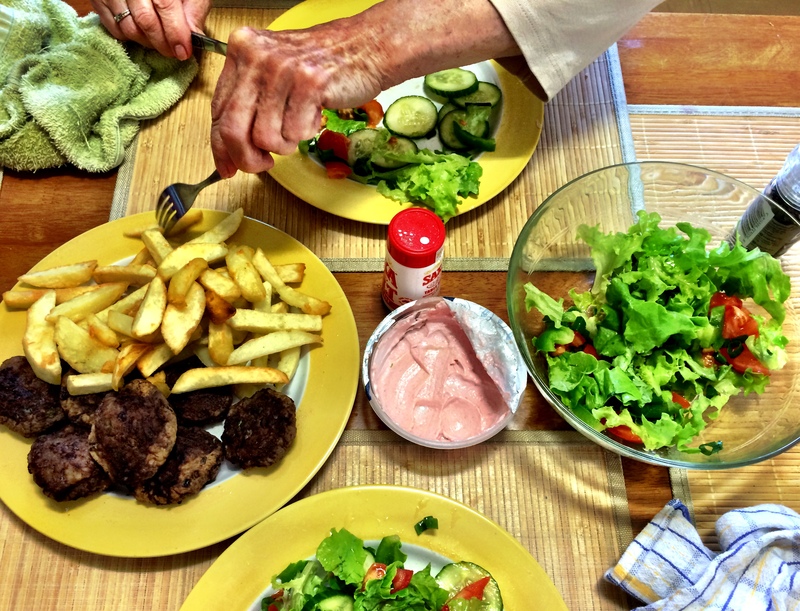 Whenever I stop fidgeting for five minutes, my favourite place to spend a Sunday is at my yiayia Maria’s house – eating, cooking, raiding her garden for herbs, eating, playing gin rummy and more eating. Her mission in life has always been to feed everyone around her and you only have to look at my mum, sister and I to see that it’s clearly an inherited trait. 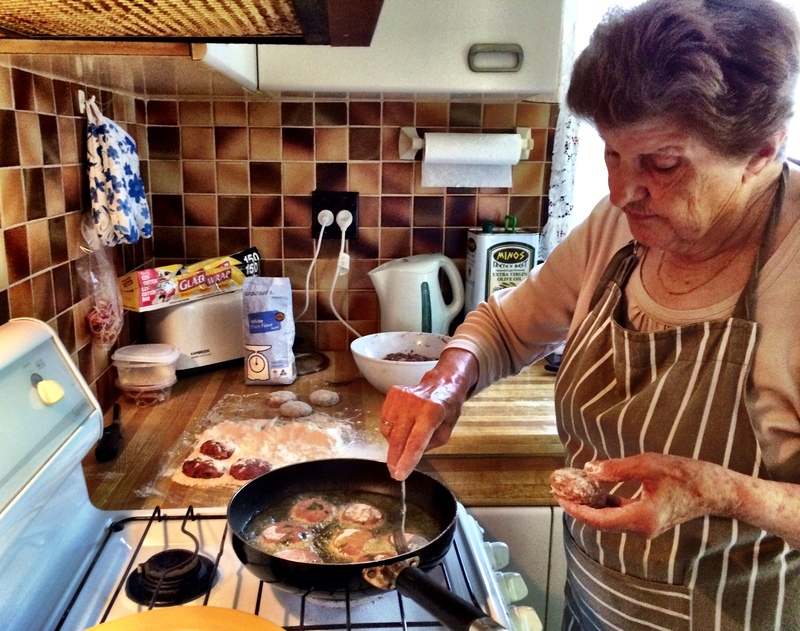 For most of my youth I took it for granted that yiayia’s cooking always tasted exactly the same (i.e. delicious). It wasn’t until I started to notch up my own miles in the kitchen that I realised that kind of consistency is hard earned. Of course I want my cooking to taste like yiayia’s right now so I’ve made a point of learning as much as I can from her over the years. Extracting a recipe is easier said than done though, and I have to watch her like a hawk to work out each step. She relies purely on sight and touch to know when something is perfect. 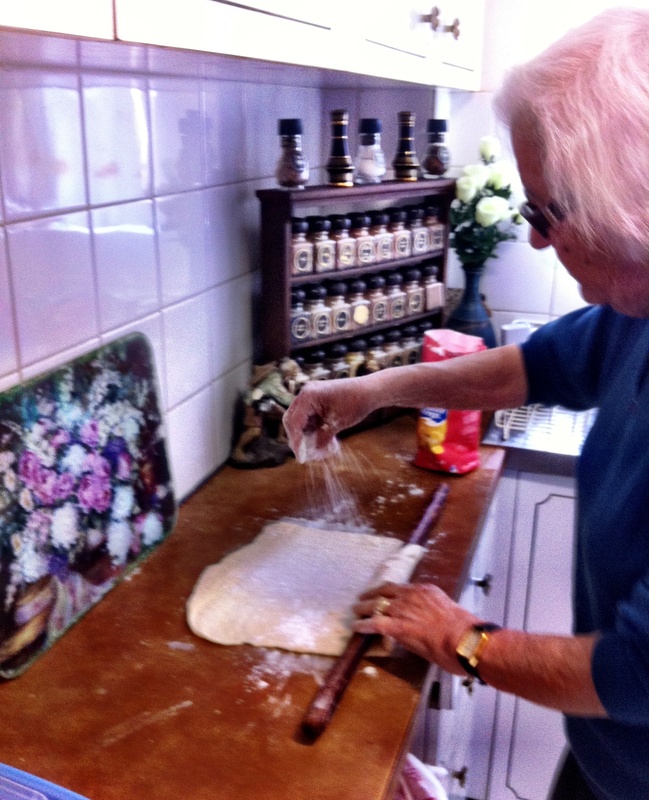 ‘Enough until the dough is ready Alexandramou’. Lucky for me we tend to focus on savoury dishes, so a little variation in quantity usually doesn’t spell disaster. 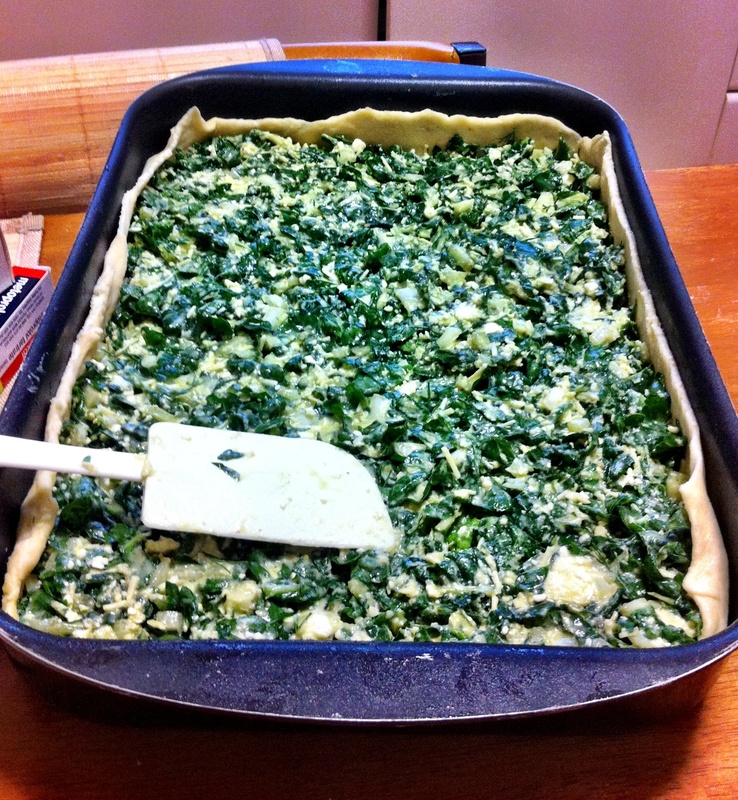 Spanakopita (cheese and spinach pie), yemista (rice and meat stuffed tomatoes) and keftethes (meatballs) are always a good starting point. I wouldn’t dare go freestyle on kourabiethes! Yiayia sometimes looks at me strangely when she sees me taking photos of her but I am so glad I do because those moments are golden. Not to mention the scribbled notes and recipes they yield. ‘That is the one meal I could eat every day for the rest of my life’. They are absolutely moreish. 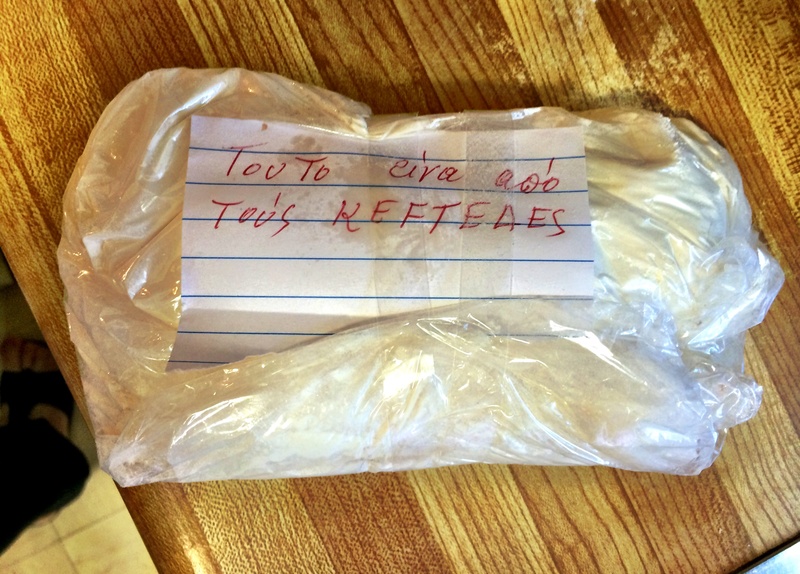 I always thought there was a secret ingredient in there…. perhaps grated haloumi for punch, or special spices? 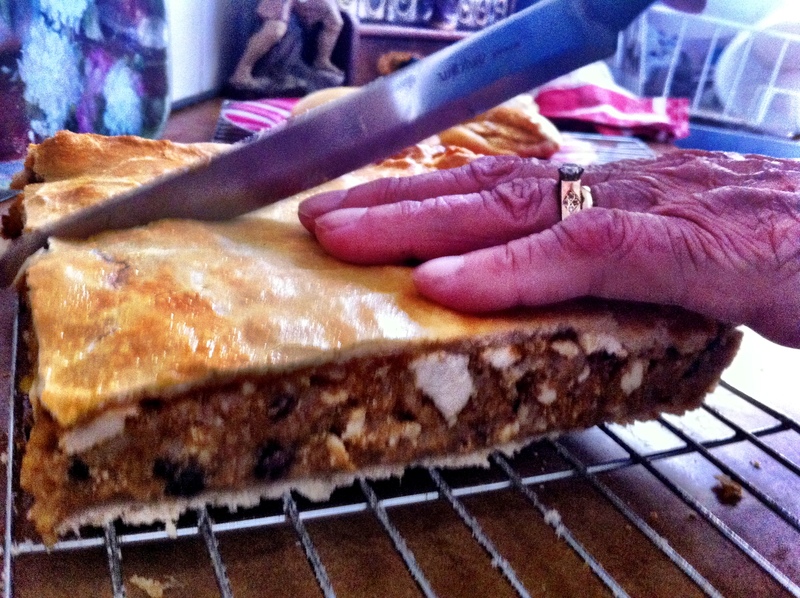 But there is nothing particularly exotic or unusual in the mixture – I’ve decided it all comes down to technique. And a whole lot of olive oil! 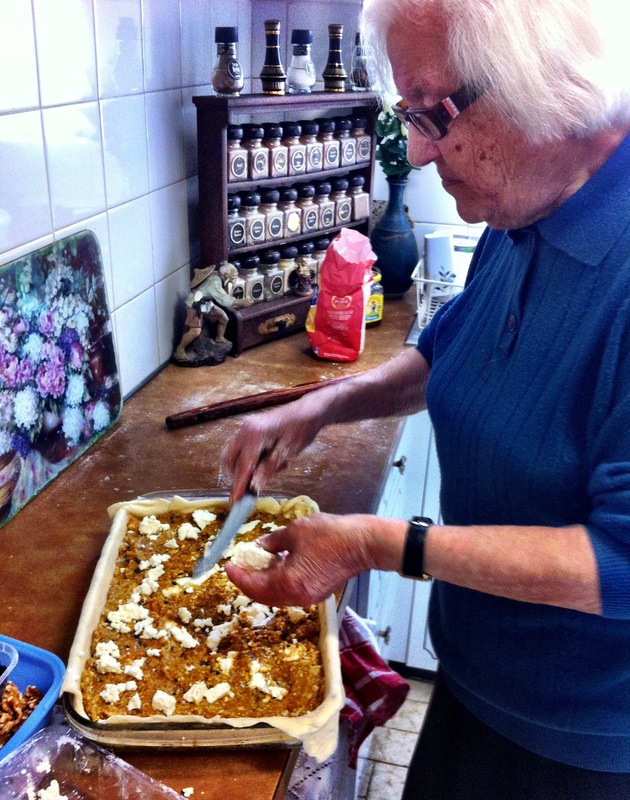 Another thing I love about my yiayia is her zero wastage policy, born from a childhood spent on a poor Greek island. She doesn’t waste a single thing, whether it be the leftover flour from the keftethes or the stems of horta. She was recycling long before the green movement. 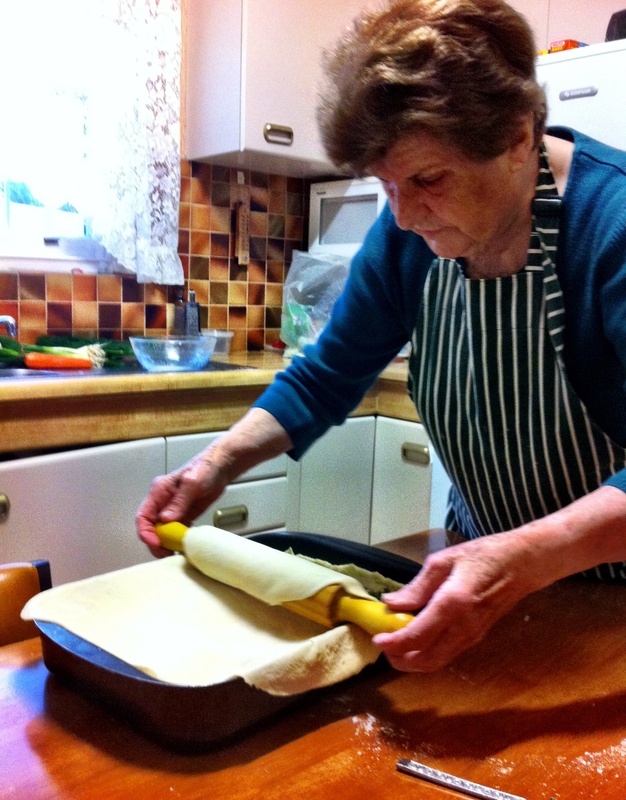 My yiayia Alexandra is just as good a cook and we’ve spent a lot of time perfecting one of her recipes in particular (well she perfected it long ago but my version still needed work). The dish is called kolokithopita and the literal translation is pumpkin pie. 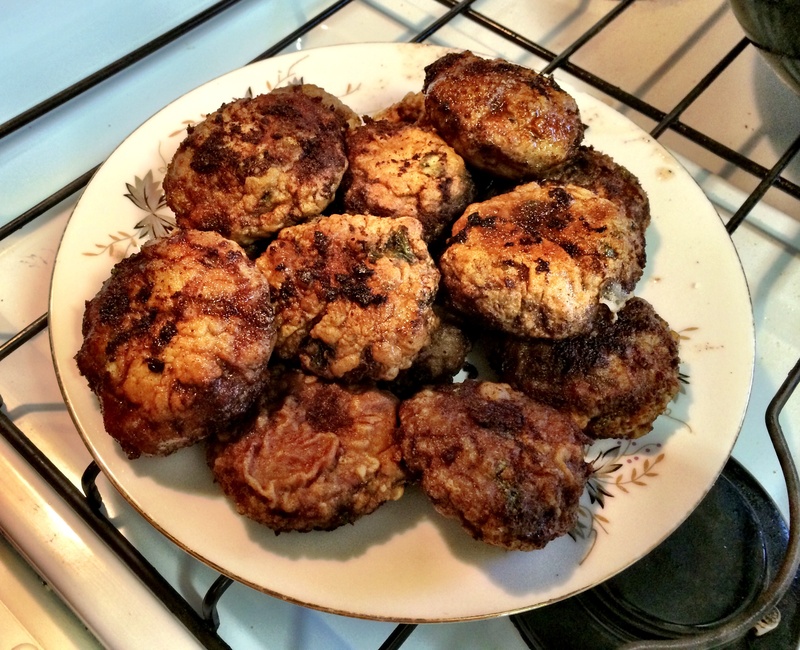 It’s an unusual dish, even by Greek standards, and I’ve never encountered anyone else who makes it. 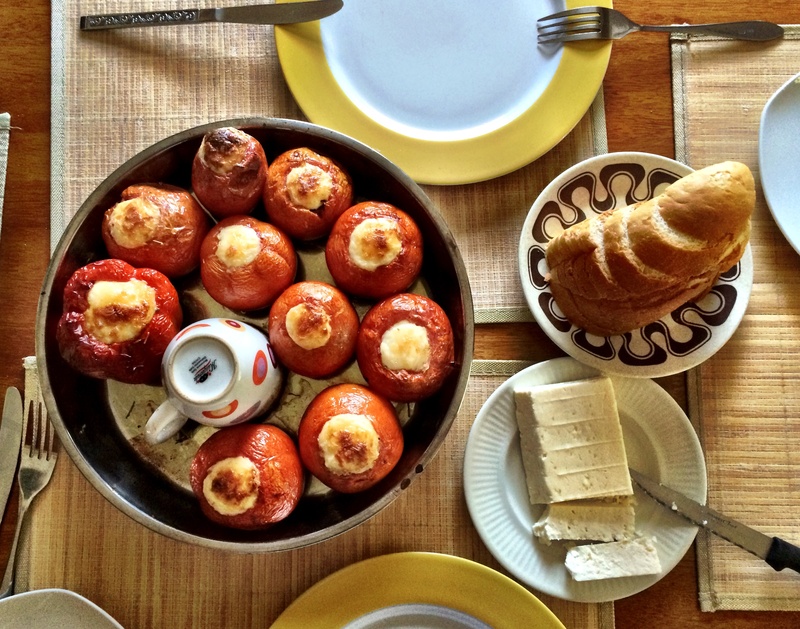 Because of this we were invited to cook it together at a Kytherian Kitchen cooking class a year or two back – thus the endless practice sessions. 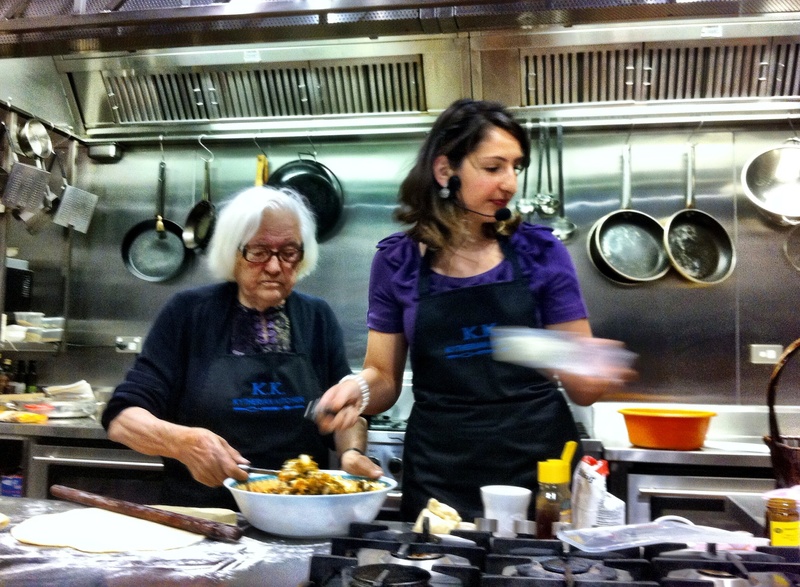 It was a very proud moment for me when yiayia stood by my side in front of a 100-strong crowd to cook with me, or rather me with her. 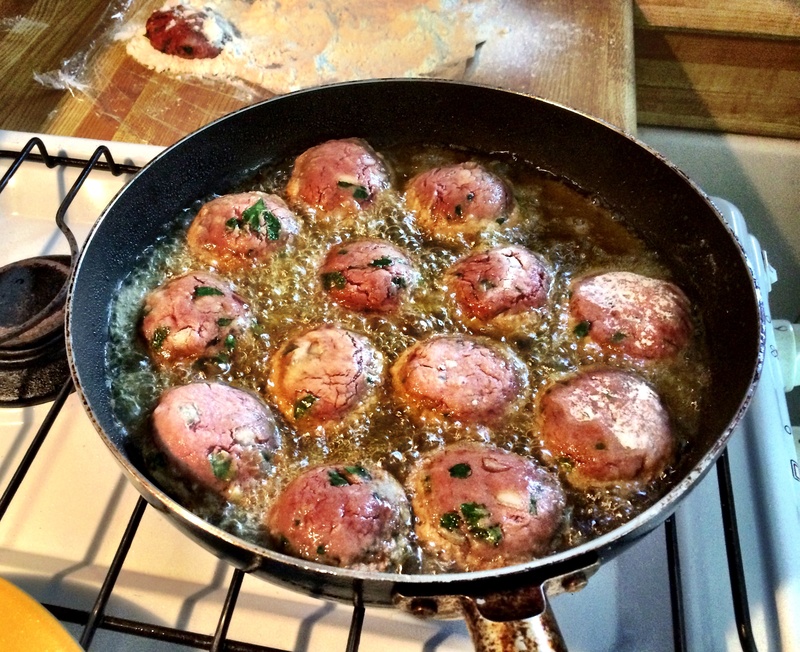 It’s always been one of my favourite dishes for its melding of sweet and savoury flavours. Forget everything you know about the sickly sweet American-style pumpkin pie. This takes on only a hint of sweetness from the raisins and honey, countered by a crunch from the walnuts, spice from the cinnamon and creaminess from the ricotta. It’s an all-round winner. Just like my yiayias. From someone who didn’t have my grandmother around past the age of 12 yo I loved reading about the precious time you spend cooking with yours. How special! Yummy too! Great post! Can we do a cooking session and make those meatballs and pumpkin pie?? 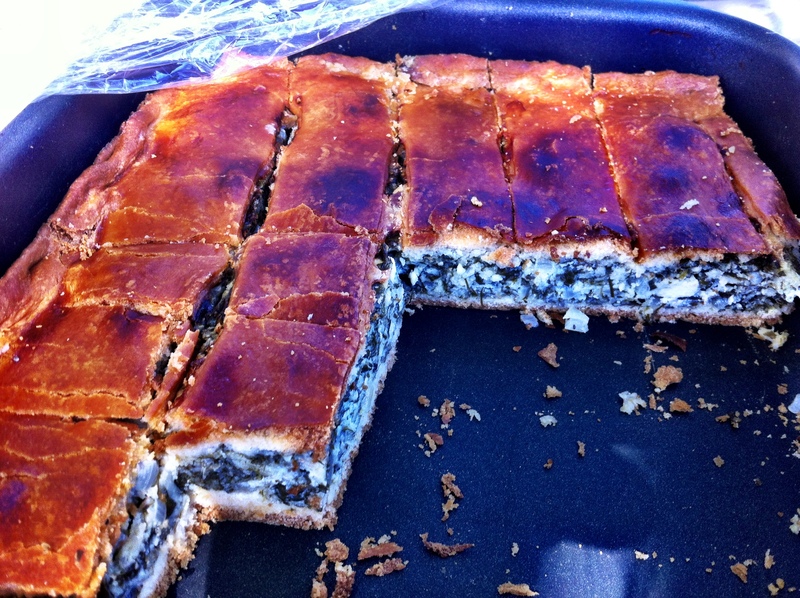 I feel so honoured to have tasted your yiayia’s spanakopita. It was amazing! That’s how we feel but to her it’s peasant food! Hi Alex I love a great food blog Congrats !!!! Thank you Ev mentioned it to me as we made our Koulouria and it made her cry thinking back to her Yiayes many wonderful memories.